A YEAR AGO THIS WEEK, Ann, Geronimo and I fled the then-largest wildfire complex in California history. We were voluntary evacuees who came home to find everything relatively intact, so our story had a happy ending. My niece and nephew-in-law weren’t so lucky; residents of Corralitos to the far south, they owned a house in Santa Rosa’s Coffey Park that, like almost all the others in that neighborhood, burned to the foundation. Many people fared similarly, some worse. “The Fires” were the second time in my life I faced a “will I die in the next five minutes?” moment. 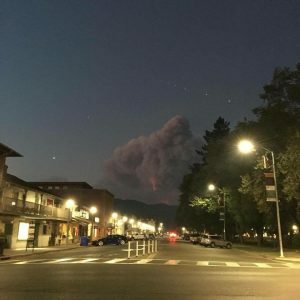 I’ve written elsewhere about the first, a ship collision, which was different in that it was more immediate; I experienced The Fires as happening in agonizing slow motion. We had time to pack a few go-bags in case the situation turned dire; the mandatory evacuation zone was two blocks to the north and expected to change, so this was a prudent move. Ann’s brother and his wife kindly told us we could flee to their Pinole home if need be, so there was that. But many businesses, including the Safeway across town, were still open, and our lights were still on. Which was surreal. So we stayed put, despite having to wear breathing masks whenever we ventured into the smoky and orange-tinged out-of-doors. The turning point came shortly after we heard that The Fires were literally advancing on Sonoma proper. I went into the middle of Broadway (Sonoma’s main drag) with my binoculars and focused them north. That was when I saw twenty- to thirty-foot flames dancing on the shoulder of the hill above town. What I saw. Click to enlarge. I walked swiftly back to the apartment. “Time to go,” I told Ann. We packed up the cat (the car was already loaded) and skedaddled south. A day later, according to the local newscasts and Facebook pages which showed long lines of cars moving slowly down Broadway, so did most of the rest of the town. The entire week we stayed in Pinole we were glued to the television and laptop. I was convinced — convinced! — that we would lose everything, except for when I was convinced — convinced! — that everything would be fine. Seesawing between these two extremes was exhausting. So when the mandatory evac order lifted (it never did reach our street), we came home. The smoke was still pretty fierce. Our building’s foyer reeked. But our apartment was none the worse for wear. And in a few more days, The Fires were contained and the smoke slowly dissipated. Some things changed. As I said, I spent a week between “it’ll all be okay” and “we’re doomed.” Before we came back, I truly believed that all I had left was the contents of my three go-bags — clothes, medicines and important books and papers — but I also grieved for those who had less, or who had died. 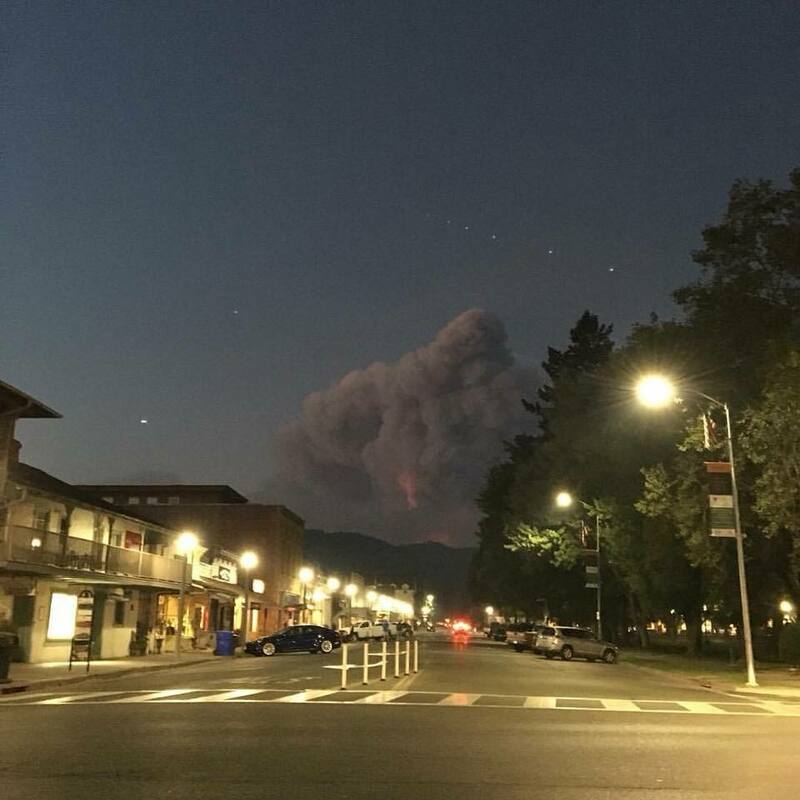 I felt a weird sort of survivors’ guilt mixed with deep gratitude: to the firefighters and first-responders, to the prevailing winds, to my in-laws. I also felt very humbled, in the way one does when encountering something bigger than oneself. 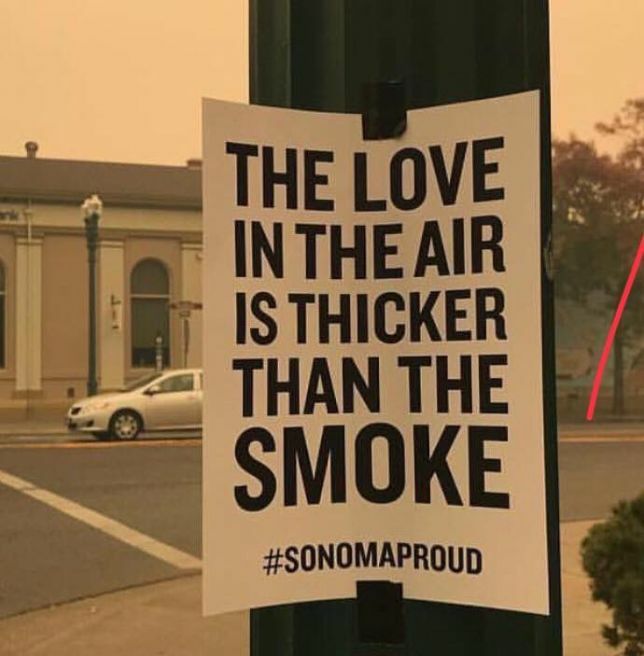 But mostly, I felt an intense sympathy and empathy for my fellow Sonomans. This feeling has expanded during the past year to include survivors and victims of any natural disaster; earthquakes, floods, tornadoes, lava flows, monsoons, and yes, fires. I find I can appreciate their situation in a way I wasn’t otherwise able to do before last year’s displacement. And when the winds blow hard, the air turns smoky orange and the sirens go off, I get The Fear.